Media Size Choose an option16" x 20"20" x 26"30" x 38"
It seems that our mad-cap trio of Larry, Moe and Curly have found themselves in the spotlight again. The soon to be released all new The Three Stooges movie has created quite a buzz in Hollywood, and amongst Stooges collectors. This has inspired artist Motor Marc Lacourciere to create his third fine art painting in The Three Stooges series: Nyuk Nyuk’s Free Movie Pass. 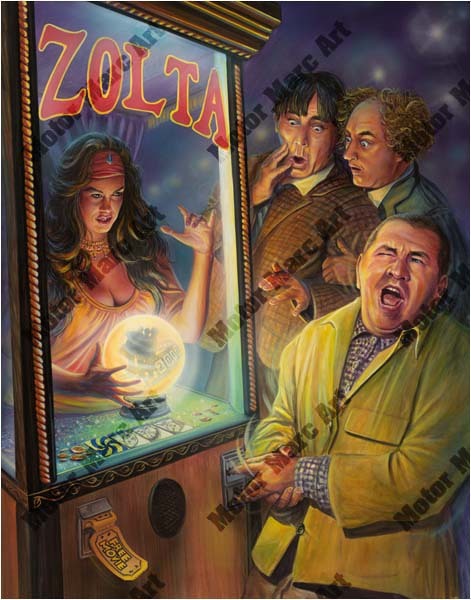 In this painting we find The Boys inquiring about their future, by seeking the wisdom of Zolta, the resident fortune teller box. What happens next is surprising and shocking for the masters of mirth, merriment and mayhem. As the globe lights up she sees a future tribute and awards them with a Free Movie Pass to this new release in the Three Stooges collection, while taking a bite out of Curly. This third painting is an invaluable memento for collectors of Three Stooges memorabilia. Marc captures the past and future in this remarkably detailed work of fine art. Lacourciere predicts that the new movie will add a new generation of Three Stooges fans to the existing millions and millions here and around the globe. Pre-order your limited print now – before they mystically disappear. 16" x 20", 20" x 26", 30" x 38"